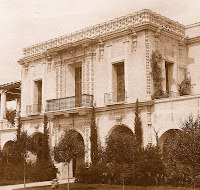 The Home Economy Building was located on the north side of El Prado, immediately east of the Panama-California Exposition's Plaza de Panama. Surrounded by arcades on two sides, the building's overall design represented the urban palaces found in Mexico City, with a corner tower modeled on that of the Palacio de Monterey, in Salamanca, Spain. Two ornamented pavilions, located on the west and south sides of the building, formed the building's entrances. 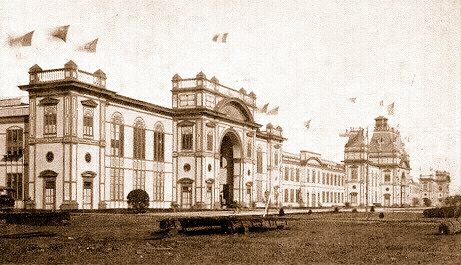 Over each entrance was situated a square heavily-ornamented and bracketed balcony, flanked by simple iron-railed balconies at each side; with a richly-decorated parapet extending around each pavilion's top edge. The building's corner tower consisted of a square open pavilion, with three balustraded arches on each of its four sides, and cartouches at the corners. A medallion-decorated parapet surmounted the tower's cornice; and two pedimented windows, topped with finials, decorated the tower's lower walls. Within the building were located exhibits relating to modern conveniences for the home; consisting of numerous electrical appliances, as well as a complete model kitchen.